Home » advice , cv , news , rework , world of warships » World of Warships: CV Rework, The Other Elephant in The Room! 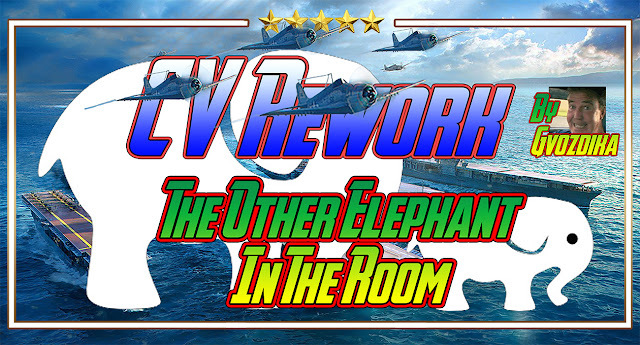 World of Warships: CV Rework, The Other Elephant in The Room! CV Rework, The Other Elephant in The Room! "I'll straight up state that I don't like the rework for lots of reasons. AA is useless. CVs are basically going to be damage farming everything else. CVs have no real way of countering or outplaying each other besides consumables which are of dubious benefit, etc. I could go on but it's all been said already". There is however one issue nobody seems to have mentioned about this whole thing. Owners of CVs and Premium CVs will get some kind of compensation if they dislike the way things are headed - because the ship(s) they ground out or paid for are being radically changed. But what about everyone else? Example 1 - Someone buys an Atlanta or grinds enough steel for a Flint. One of the key selling points of the Atlanta/Flint is it's ability to shoot down planes - thanks in no small part to DFAA. In the rework DFAA is nowhere near as good as it used to be. AA in general is nowhere near as effective as it used to be. So these AA cruisers are nerfed by proxy - thanks to one of their key roles (shooting down flying stuff) being largely negated in the rework. Are the owners of these ships going to be compensated in some way - especially if money has changed hands? Example 2 - A player has HMS Hood - with that comedy DFAA system that basically downs everything with wings in a 1.5km radius. It makes up for the cross-eyed gunners who refuse to shoot what you're aiming at and the fact that your ship is three miles long. Under the new system DFAA won't work in the same way (e.g. it isn't as good) and I don't think you can boost the range of your AA like you can now - so you are stuck with the 1.2km range cap of the rocket AA. A nerf by default. Boo. Hiss. Example 3 - Players of USN Battleships. The AA of that line is currently excellent - so much so that it is one of the key elements of the US BB line - they can look after themselves or at the very least make a CV think twice before attacking them. Given that most of the US AA is focused in the short/mid range bracket - which is pants in the rework by the way - every USN BB is being nerfed. That applies for every line where strong AA is a characteristic - the ships with already weak AA won't notice the difference. People who bought the Jean Bart (again, strong AA) will find their ship FAR less able to defend itself the day 8.0 hits. Example 4 - (Last one I promise) - Anyone who buys a premium DD. If you have played vs. the reworked carriers you will know that a DD driver's gameplay experience has gone down the toilet. Stuff the Radar cruisers - those I can deal with. Being chased around the map by a 200 knot squadron of rocket-hurling planes - that's not so fun. In each of these cases the player experience is being changed (not for the better) and the Waterline video was stunning it's avoidance of talking about the SURFACE SHIP experience. Given that most players in this game drive around in surface vessels, some paid for, others ground out by FTP means - that isn't ideal - not with 8.0 looming on the horizon. So am I barking up the wrong tree? Or do we think that WG could at least register the fact that for a lot of people - 8.0 is going to nerf their ships indirectly and make the experience of playing this game a lot less enjoyable. "For transparency - I don't own Atlanta or Flint. I do own the HMS Hood, HMS Cossack and quite a few USN BBs. =)"